Weekly Market Analysis: December 7th to 11th 2015 - Find the best Binary Options Brokers, Binary Options Bonuses, Binary Options Signals, Binary Options Software and everything Binary Options related on Binary Options Directory! 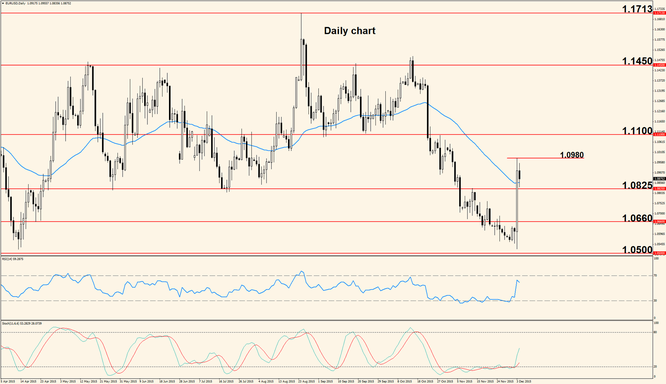 Weekle Analysis: Last week we saw huge euro strength at the time of the ECB Press Conference. The pair soared, erasing the losses incurred over several previous weeks. The NFP report, although better than anticipated, didn’t manage to bring the pair back down. Price pushed through the resistance at 1.0825 and through 50 days Exponential Moving Average, bouncing lower at 1.0980. This level will now act as short term resistance but we are likely to see another push above it. Once the level is broken, the pair will head towards the next target, which is 1.1100. Keep in mind that sometimes after such a huge move, the market moves sideways for a while or even retraces lower; if this occurs, the first barrier is 1.0825. After a wild week such as the one that just ended, this week the economic calendar is light and we will probably see less movement. Monday the Eurogroup Meetings take place, followed Tuesday by the ECOFIN Meetings, attended by finance ministers from the Eurozone member states. 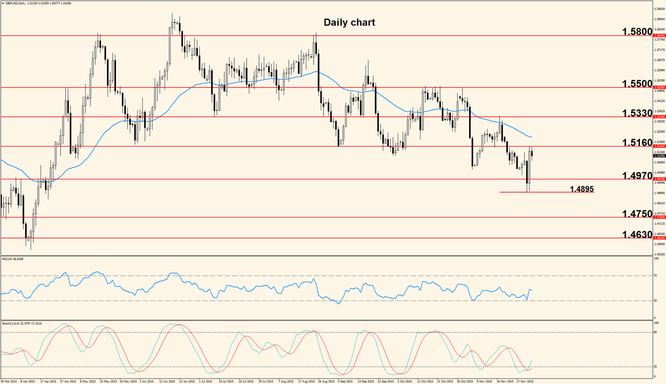 Wednesday is a slow day for both Europe and the United states, while Thursday the only notable event is the release of the US Unemployment Claims. Friday action picks up as the U.S. Retail Sales are released, together with the Producer Price Index and followed by the University of Michigan Consumer Sentiment survey which acts as a leading indicator of consumer spending. However the impact is often mild and depends on how big is the difference between actual and forecast. The pair dropped earlier during the week, just to climb back up Thursday, giving us a difficult to trade period. The U.S. jobs data didn’t have the anticipated high impact, probably because the pair had already moved strongly earlier in the week. Although the NFP report didn’t create the volatility we are used to, the effects will probably extend to this week and we will see US Dollar strength. Price stopped at 1.5160 but this could be just because the week ended, not because a move lower is next, so the first day of the week will be important for short term price action. If the pair can climb above 1.5160 and turn this level into support, we will likely see further upside movement, possibly into 1.5330 resistance; of course, for that to happen, the 50 days Exponential Moving Average must be broken first. From a medium term perspective, we don’t have a higher high so the downtrend is intact. Monday BOE Governor Mark Carney will testify before the Committee on Economic and Monetary Affairs of the European Parliament and Tuesday the Manufacturing Production numbers come out, showing the change in the total output generated by the manufacturing sector. Later in the day, NIESR will release an Estimate of the British Gross Domestic Product; this estimate is usually pretty accurate so we are likely to see some volatility at the time of the release. Another important day of the week is Thursday, when the Bank of England will announce the interest rate and members’ votes. The rate is not expected to change but a statement will be released, outlining the reasons behind the decision and this document can contain clues about future rate changes, thus creating volatility.